We celebrated five resident’s birthdays in July with a special birthday BBQ. The birthday girls and boys were aged between 72 and 99 and totalled almost 450 years between them! All five of them blew out candles on the birthday cakes as staff and residents gathered around to sing Happy Birthday. The birthday party was the first time we had enjoyed a party in our new garden, which has a lovely patio with tables and chairs with parasols to protect us all from sun. Luckily it was a beautiful warm day with blue skies, perfect for eating outdoors. Chef prepared some lovely home made burgers, marinated chicken breasts and prawns that he barbequed for us. They were served with hot, minted, baby new potatoes and a selection of salads and washed down with a glass of Prosecco. Pudding was slices of the birthday cakes, which was a choice of rich chocolate cake or Victoria sponge with jam. Everyone enjoyed the birthday BBQ on the patio! At Fairfield we always like to celebrate birthdays and mark the occasion with a celebration of some kind. These five birthdays were the first that we had celebrated since we moved into our new home. 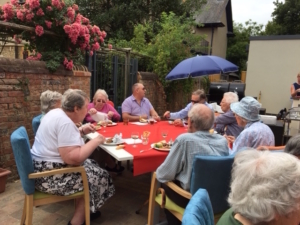 The new home provides wonderful spaces for all the residents to get together, but it was very special to be able to have the first birthday party out on the patio. As we welcome even more residents to Fairfield, we look forward to being able to have more birthday parties, although not all of them will be on such a perfect day for a BBQ!